Rolls studded with marzipan and raisins (Rosinenschnecken) are one of my favorite things to buy from a bakery in Germany. 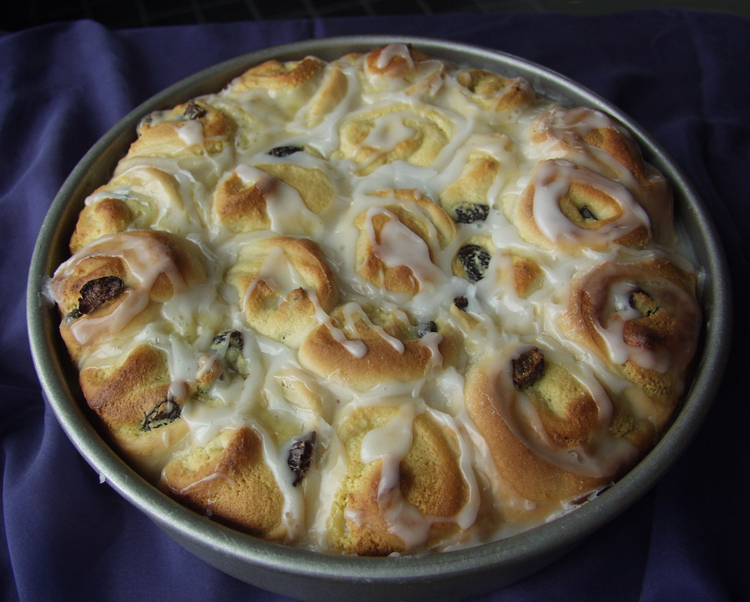 These are Rosinenschnecken with an American twist, baked snugly together in a cake pan like cinnamon rolls. Because I do not like it when yeast pastry is dry, I added two eggs to the filling, which should be very soft and easily spreadable. Depending on the size of the egg, one egg might be enough, so start with one. 1. Combine the yeast with the milk in a small bowl and let stand for 10 minutes until frothy. 2. Mix the flour and the salt in a large mixing bowl. Gradually add the yeast mixture. Stir in the butter, sugar and vanilla extract. Knead into a smooth dough using the kneading attachment of an electric mixer. The dough should be sticky; if it is too liquid, add more flour, 1 tablespoon at a time, until the dough detaches from the sides of the bowl. Cover and let rise for 30 minutes. 3. In the meantime prepare the filling. Process the marzipan with the almond extract and 1 egg in the food processor until smooth. If the mixture seems dry and crumbly, add a portion or the entire second egg, as needed. Soak the raisins in hot water for 5 minutes, drain, rinse again under cold water and drain. Dry well with paper towel. Add them to the filling. 4. Briefly knead the dough on a lightly floured work surface to remove any air bubbles. Divide the dough in half. On a lightly floured surface, roll the first piece to a rectangle about 15” x 8” (37 cm x 20 cm). Spread half of the filling evenly on the dough, leaving a 1-inch (2.5 cm) edge on all sides. Roll up the dough lengthwise into a snug log. Pinch the dough firmly together along the seam, and pinch both ends of the log together to seal. Repeat this with the remaining dough and filling. 5. Grease a 9-inch (22.5 cm) cake pan. Carefully cut the logs into 2-inch (5 cm) slices and place them snugly together, with their cut sides up, in the cake pan. 6. Cover and let stand for 30 to 40 minutes, until the dough has visibly risen and the rolls are filling most of the pan with no gaps between them. 7. Preheat the oven to 375 degrees F (190 degrees C). Bake the rolls in the preheated oven for 20 to 25 minutes, or until lightly browned. 8. Mix the confectioners’ sugar with just as much water to make a smooth thick glaze. Drizzle the glaze over the rolls immediately after you remove them from the oven. Let cool, then serve the rolls right from the pan, or unmold them onto a serving plate. Looks great. Love German recipes.